Many people don't know that you can tap local Big Leaf Maple trees for sap. Here on the farm we have plenty of maples, and we began tapping them in 2009. At first, we only wanted the sap so we could make our own syrup. It took a bit of effort, but we were amazed at the quantity of sap we got. 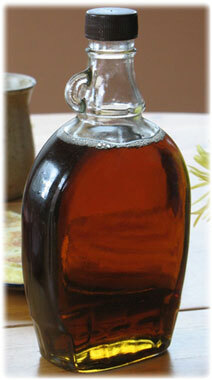 Making syrup from Big Leaf maples is a little bit of work, but it's worth it. The maple trees out here on the West Coast have a slightly lower sugar content than the ones back east, so you have to gather quite a bit of sap --- typically around 50 gallons of sap will make around 1 gallon of syrup. Also, since our weather is milder here than in Ontario/Quebec, we get winter rain, and therefore our sap collection system is designed to keep the rain out of the collection containers. Tapping trees doesn't injure the tree --- once the tap is removed, the tree heals itself by growing over the hole and enclosing it. Generally we don't tap in the same spot the next year. As we collect the sap, we freeze it. Once we're finished collecting it, we put it in enormous pots on the stove and slowly heat it. As it steams, the water evaporates, and eventually you're left with pure maple syrup. That's all there is to it. No additives of any kind. We use the syrup on more than just pancakes. We use it on plain yogurt, or on fruit salad, or on oatmeal. We enjoy it greatly, and believe it's a healthy and delicious natural food. Plus, for us, it's completely organic. One thing we recently discovered though, is that the sap itself is a delicious and refreshing drink that is destined, we believe, to be a great alternative to bottled water. Maple sap is water that has been drawn up through the massive root system of the maple tree, and filtered through the perfectly designed filtration system of the tree itself. It tastes like ultra-pure water, but it has an almost imperceptible sweet taste, being about 3% maple sugar. And it's loaded with vitamins, minerals and antioxidants. 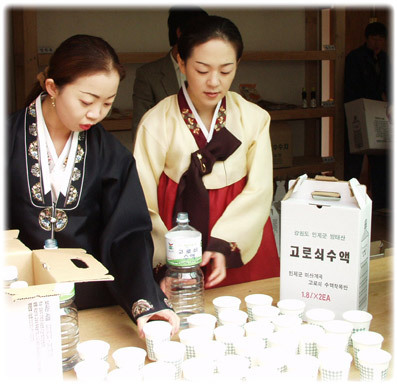 When we first discovered how refreshing the sap tasted, we began to research it a bit more and found out that the Koreans have been drinking it for centuries and they call it "gorosoe." For them, it's not just a refreshing drink, many of them believe there are health benefits too. We don't know if there are health benefits, but it sure tastes good. And it's as organic as you can get.